The internal CV voltage scale is 1V/Oct. Each phaser has a reasonably accurate one volt per octave direct control input that can track the keyboard voltage. Normalization is used, routing the V/Oct input signal of phaser1 into phaser2 when the phaser2 V/Oct input is left unplugged. Total control range is about 18 octaves. The Frq knob goes over the top 9 octaves of this range. Through the V/Oct and Modulation inputs you can go deeper, but you get into the LFO range and audible phasing effects would disappear. It is however possible to use the phasing effect on LFO control signals in the 1Hz to 10Hz range by supplying the V/Oct with e.g. a fixed -5V control signal, which can create quite interesting LFO effects on e.g. drones. All inputs and outputs are DC coupled, so CV signals can pass the module equally well as audio signals. Only the internal resonance is AC coupled, so resonance drops off below roughly 10Hz. Additionally each phaser has a modulation input, also at 1V/Oct when the mode is set to sweep. When the mode is set to spread it behaves like the modulation sensitivity is halved, also when it is in half mode where only half of the poles in each phaser are modulated by this input. These inputs are not normalized, in fact if no plug is connected the modulation level knobs receive a fixed voltage so a manual spread value can be set. Audio input is maximum 12V peak/peak before clipping occurs and there is 6dB attenuation from input to output to enable resonance peaks without clipping. Audio routing is as follows: If a jack is connected to input1, and if input2 is unconnected, then the audio will route into both phasers. In this mode you can use the two phaser outputs as a stereo signal. Connecting a jack to input2 will override this internal input1->input2 connection and separate both phasers. 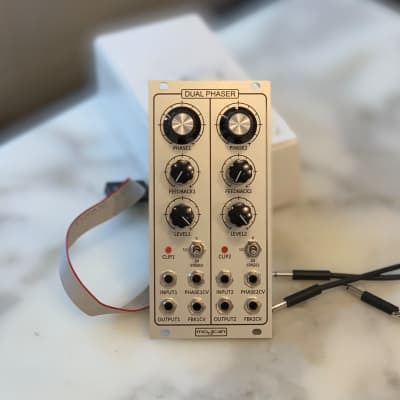 If audio is routed into input1 and if input2 is left unconnected, and if a jack is connected into ónly output2, then the two phasers are automatically set to "inverse parallel" mode. Meaning that if both phasers are set to exactly the same knob settings the phaser outputs would be in exact reverse phase and thus result in almost silence. If audio is routed into input1, and if output1 is connected with a short cable to input2, and if output2 is taken as the overall output, the two phasers are in series and thus result in one 16-pole phaser. To summarize: you can use the phasers fully separated, parallel with two (stereo) outputs on one input signal, parallel with mono output but with one phaser in reversed phase before the mixing of the outputs of the phasers take place on output2, or in series. All this is accomplished by the internal switches in the connectors and only depends on which inputs and outputs have a plug."